"This is a recipe that I like." See how to make traditional Southern-style fried green tomatoes. my boyfriend was a cook in a really nice southern restaurant, and he dipped them in milk instead of egg and fries them in canola oil. I think they come out a lot better without the 'eggy' taste. 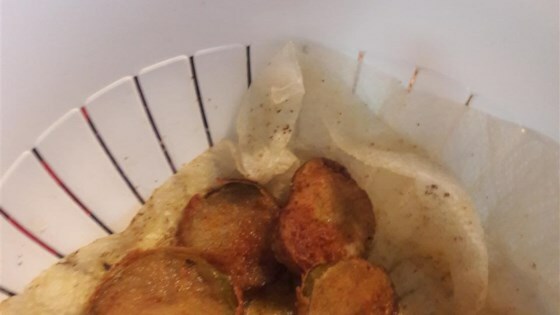 A good Southern cook knows that OLIVE OIL would drown the flavor of Fried Green Tomatoes! YUK! This recipe needs tweaking for us. I fried one, using Canola Oil, and tasted it, then added garlic salt, onion powder, and garlic pepper to the cornmeal mixture, MUCH better with the additions.